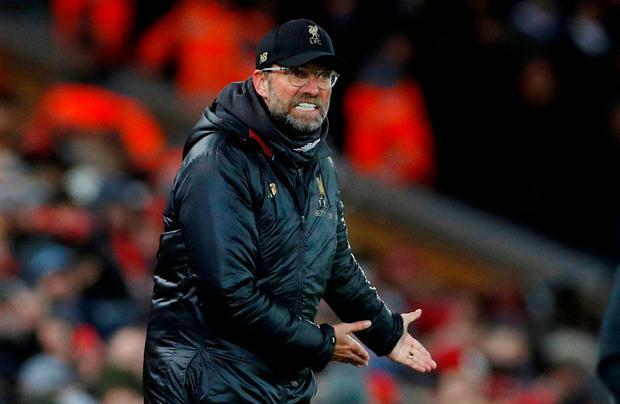 Liverpool manager Jurgen Klopp lamented the wintry conditions, the referee's failure to award Naby Keita a second half penalty and a failure do enough in the game to earn a win that would have seen his side go seven points clear in the title race. Klopp's side failed to fully capitalise on Manchester City's defeat the previous night as they were held 1-1 at home by Leicester City on Wednesday while below them the top-four fight took another twist. Liverpool had a gilt-edged opportunity to open up a seven-point lead over City with 14 games left but despite taking an early lead through Sadio Mane they ran out of steam. Harry Maguire equalised just before halftime and Liverpool, inspired so often this season, failed to raise their game after the break as Leicester claimed a deserved draw. Klopp's side have 61 points from 24 games with champions City, beaten at Newcastle United on Tuesday, on 56. Klopp told BT Sport: "Frustrating? I am not sure. It is a football game, against a strong side, on a difficult pitch. That's how it is. "It started snowing when we were warming up. It was all OK and when we came out there was snow on the pitch. We could not do anything against that. "We had most possession in the game. We controlled the game completely before we gave some balls away. "The only proper situation was the free-kick they got. They got the free-kick and then they score. We defend the first one, then the second one and a third one. Well done by (Ben) Chilwell how he brings that ball back, because it was really difficult. "We had a few situations but we did not have enough. Second half we tried again but Leicester were a little bit more confident." Asked about the decision not to send Maguire off, Klopp replied: "I really don't understand why you ask me that because I am not a referee. I am a manager. "It will be interesting to see what you think about that. I think it is a 100 per cent chance. "Not only Sadio (Mane) was through, but Mo (Salah) was on the other side too. But, again, Martin Atkinson thought it was a yellow card and not a red." Klopp also thought Liverpool deserved a penalty when Keita was brought down in the area in the second half. The German added: "I don't think you need VAR for that because of the best position of the referee. That's it. He didn't want to give it. I think you agree it was a penalty. "Very often I stand here over the last couple of weeks when we got a penalty and everybody asks 'Was it really a penalty?' What do you need? "This today was a very clear one and we didn't get it, hopefully everyone is happy that we didn't get it and now we can carry on."